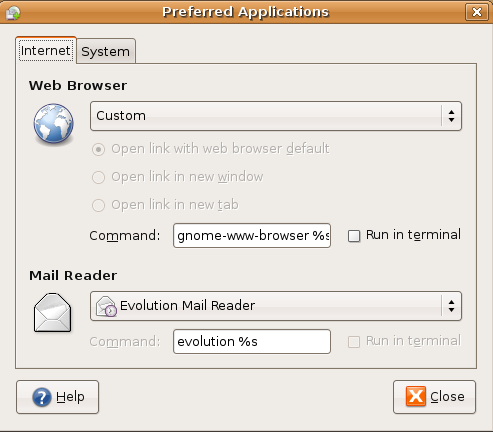 If you want to select your preferred applications for Web browser,Mail reader and terminal emulator you can select very easily from gnome preferred application option. Once it opens the window you should see the following screen here you can select web browser and mail reader applications this is very helpful if you have 2 or 3 application which does the same job and you want to use one of your favourite application as preferred application. Your explanation is clear, but not really a very good way to set your Preferred Applications! An easy example would be to go to your pictures folder and find a picture file. 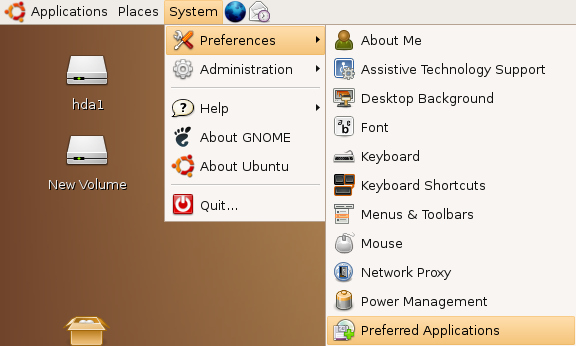 If you right click your file and select ‘properties’, then you can see a tab for ‘open with…’ and a list (in my system) of options, including ‘Firefox 2”Firefox 3’ ‘F-Spot Viewer’, Gimp, gThumb, Image Viewer, Mirage, Thunderbird, and Sunbird – plus an option to find your own application and add it to the list. This method will work for absolutely every file, whereas the menu you offer only sets a few options. ‘Multimedia Player’ for example will allow Rhythmbox, Totem or Banshee. When I open a file, I want it to open with something lighter, and Audacity is very light and quick to load up. (option not available here). The time when you need to set default applications is usually when you need to open a file. To open the ‘Properties/Open With…’ dialogue seems the most efficient to me. I now removed the unnecessary menu item, which should rather be included in the ‘Control Panel’ area (press alt+f2 and then type gnome-control-center… Better still, right click the desktop or panel, and choose ‘add launcher’ and enter it there! This is one step ahead of the ‘advanced preferences’, extremely easy to navigate (using the filter, type ‘pref’ and you’ll see the preferred applications). Personally, I think that this is one area that ubuntu needs a little work, and is the main reason that ‘with linux, you must learn to use the terminal’. 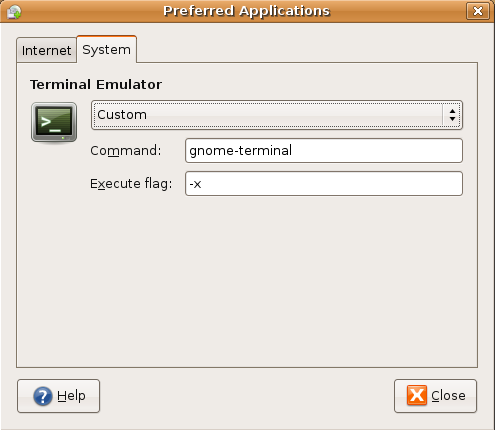 With 8.04 I noticed a very big improvement, so I don’t aim this criticism with any malice – but perhaps this guide could have covered the more useful avenue of finding settings through the gnome-control-center – which isn’t readily available from the desktop if you don’t know about it! The reaction of Ben helped me out! 🙂 Thanx Ben!